Located along the Atlanta Beltline in front of Old Fourth Ward Park and next to Two Urban Licks, the Beltline Bike Hotel becomes a point of attraction in itself for tourists, business professionals, and athletes that consider cycling as one of their greatest passions. The hotel connects to t he Beltline with its internal velodrome, which becomes the iconic public space of the project, incorporating a special attraction to the Beltline centered around a plaz a full of bike friendly retail options. The velodrome is open for recreational riding but can also be reserved to host cycling events. The Beltline is a development that connects different neighborhoods and parks in Atlanta. Millennial Hotel proposes different activities to attract different people and contribute to the Beltline's artistic and sportive context. The hotel is designed by taking the Beltline trail and into the site with different social, cultural, and sportive activities. The hotel has a convertible open and closed exhibition hall, restaurant and bar, swimming and fitness center, open performance area, meeting rooms, and a Midtown view terrace that exhibits green spaces open to the public. Ideally the hotel would be occupied 24/7. Varying room types facilitate people from all ages, commitments, and financial situations. 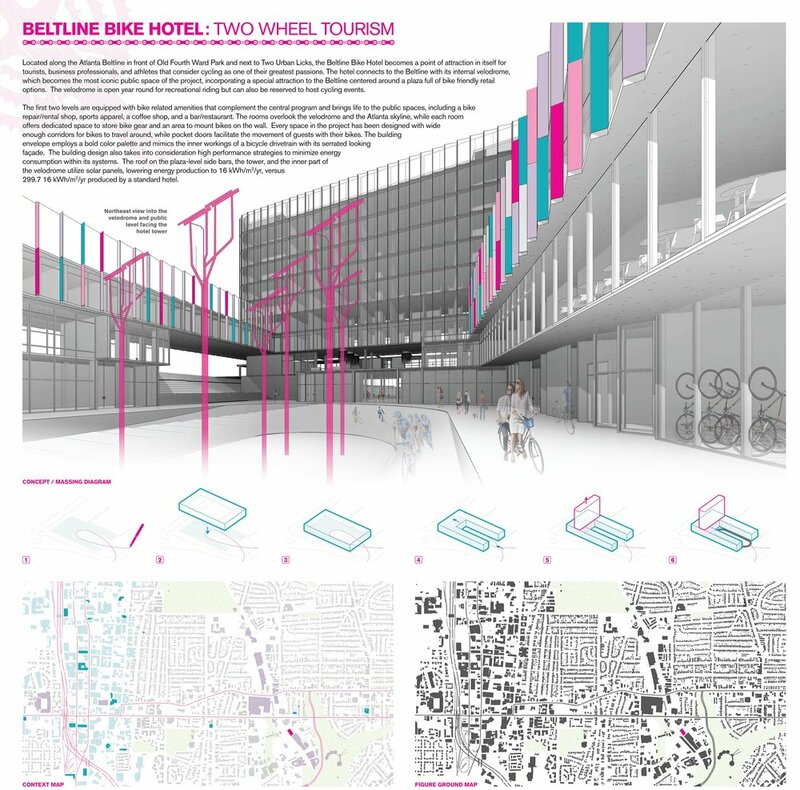 The concept for the Beltline Hotel is to create a vertical extension of the beltline trail replicating the same strategies of integrating public, private, entertainment, and exercise along a single connective path. 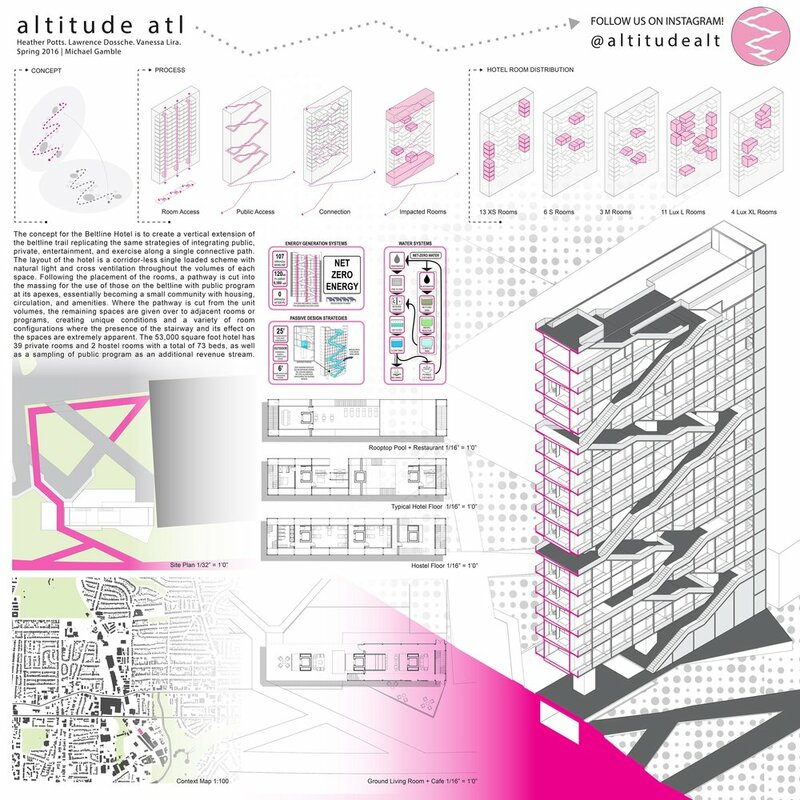 The layout of the hotel is a corridor-less single loaded scheme with natural light and cross ventilation throughout the volumes of each space. 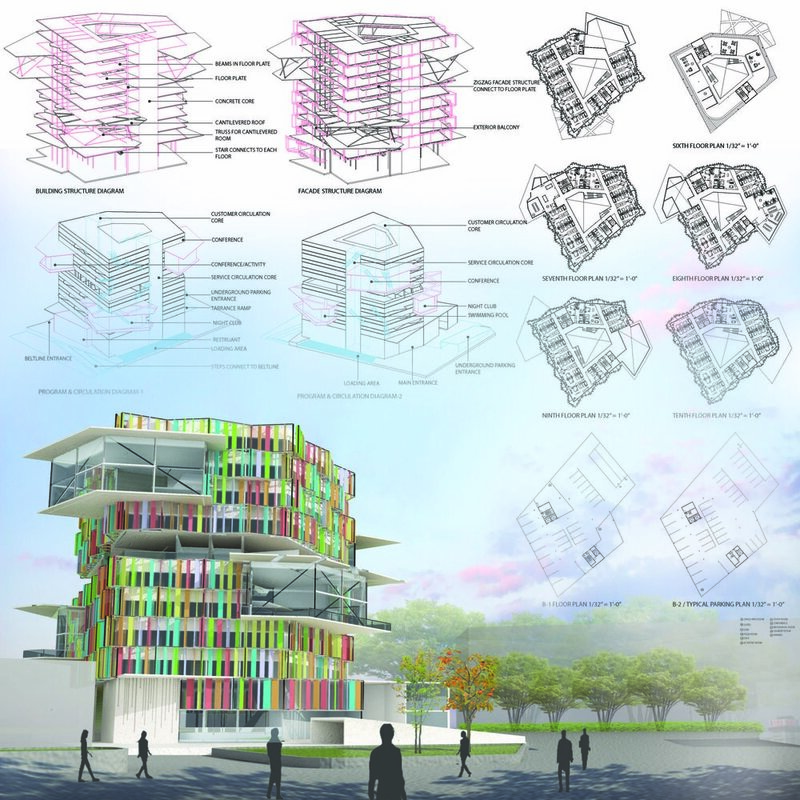 Following the placement of the rooms, a pathway is cut into the massing for the use of those on the Beltline with public program at its apexes, essentially becoming a small community with housing, circulation, and amenities. Where the pathway is cut from the unit volumes, the remaining spaces are given over to adjacent rooms or programs, creating unique conditions and a variety of room configurations where the presence of the stairway and its effect on the spaces are extremely apparent. The 53,000 square foot hotel has 39 private rooms and 2 hostel rooms with a total of 73 beds, as well as a sampling of public program as an additional revenue stream.